The aim of this randomized, controlled prospective clinical trial was to evaluate and compare the performances of three different universal adhesives using a flowable universal composite resin in the restoration of non-carious cervical lesions (NCCLs) over an 18-month period. Eighteen participants recieved 99 restorations from a single operator. NCCLs were divided into three groups according to adhesive systems used: Clearfil Universal Bond (CU), iBOND Universal (IU), and G-Premio Bond (GP). No enamel bevel was placed and no mechanical retention was created for the NCCLs. Prior to adhesive procedures, selective etching was performed with 37% phosphoric acid. Adhesive systems were applied following manufacturers’ instructions and the lesions were restored with a flowable composite resin (G-ænial Universal Flo). Restorations were finished and polished immediately after placement and scored with regard to retention, marginal discoloration, marginal adaptation, sensitivity, surface texture, and color match using modified USPHS criteria after a week (baseline) and 6, 12, and 18 months. Descriptive statistics were performed using chi-square tests. The 18-month recall rate was 88.8% and retention rates for CU, IU, and GP were 100%, 96.8%, and 100%, respectively. 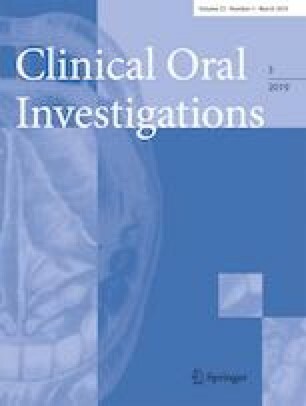 No restorations exhibited post-operative sensitivity and secondary caries. After 18 months, CU, IU, and GP groups showed similar alpha rates for marginal adaptation (CU 93.1%, IU 90%, GP 81.8%) and marginal discoloration (CU 100%, IU 90%, GP 87.9%). A total of ten (CU 2, IU 3, GP 5) restorations exhibited bravo scores for surface texture and three (CU 2, GP 1) restorations showed bravo score for color match. No statistical differences were found among the tested adhesives for any criteria evaluated (p > 0.05). The three adhesive systems demonstrated similar performances during the 18-month follow-up in the restoration of NCCLs. Universal adhesives could be used successfully in the restoration of NCCLs.